Throughout ancient history until our modern era, every civilization in the world has used wood to create useful as well as beautiful and decorative objects. We see examples of woodworking by the ancient Egyptians, Greeks, Romans, and Chinese. Many other ancient cultures around the world also practiced woodworking, employing many different styles and techniques. Primitive weapons used for defense and hunting and simple tools used for building shelters have been used throughout the ages. Archaeologists discovered a wooden club and digging sticks at the Kalambo Falls on the Kalambo River on the border of Zambia and Tanzania. As man developed his woodworking skills, he became better able to kill animals for food, clear land with his axe to grow crops, and build boats, buildings, and furniture. Woodworking thus became an important process that led to the advancement of civilizations. Because of the vast amount of material to cover related to the history of woodworking, this article will focus on woodworking from ancient times to the Middle Ages, focusing on some of the more prominent civilizations. Woodworking conducted in other civilizations will be omitted – not because they are less important but again, due to the sheer volume of material. We will, however, briefly review some of the more prominent tools woodworkers used throughout history. Many ancient Egyptian drawings going back to 2000 B.C. depict wood furnishings such as beds, chairs, stools, tables, beds, and chests. There’s also physical evidence of these wooden objects, as many were found well-preserved in tombs due to the country’s dry climate. Even some sarcophagi (coffins) found in the tombs were crafted from wood. Ancient Egyptian woodworkers were noted for regularly practicing their craft and for developing techniques that advanced the craft for future generations. For instance, they invented the art of veneering, which is the practice of gluing thin slices of wood together. The earliest examples of veneering are over 5,000 years old, found in the tomb of Semerkhet. Many of the pharaohs were buried with objects that had African ebony veneer and ivory inlays. According to some scholars, Egyptians were the first to varnish, or “finish” their woodwork, though no one knows the composition of these “finishes”. Finishing is the art of placing some kind of protective sealant on wood materials in order to preserve them. Ancient Egyptian woodworkers used a variety of tools, including axes, adzes, chisels, pull saws, and bow drills. During the earliest pre-dynastic period (circa 3100 B.C., about the time of the first pharaoh), they also used mortise and tenon joints to join pieces of wood. Pegs, dowels, and leather or cord lashings strengthened these joints. Animal glue was used during the New Kingdom period (1570 – 1069 B.C.). Egyptologists found the world’s oldest piece of plywood in a third dynasty coffin. It was made of six layers of wood four millimeters thick held together by wooden pegs. The Egyptians used a variety of wood to build their furniture and other objects. The wood came from native acacias, local sycamore, and tamarisk trees. However, when deforestation occurred in the Nile Valley starting from the Second Dynasty, they began importing cedar, Aleppo pine, boxwood, and oak from various parts of the Middle East. They also imported ebony from Egyptian colonies and used it to construct items that went into tombs such as inlaid wooden chests. In the Book of Genesis, we encounter one of the Bible’s first woodworkers – Noah. After God revealed his plan to destroy a corrupt humanity by flooding the earth, He gave Noah a 120-year project – build an ark of cypress wood coated with pitch inside and out. God furnished him and his three sons with precise instructions and dimensions. The ark was to be 300 cubits long, 50 cubits wide and 30 cubits high. If we convert cubits into feet based on the common cubit of 17.5 inches used by the Hebrews, we get an Ark that is at least 450 feet long, 75 feet wide, and 45 feet tall (about the size of a 4-story building). The sheer size of the Ark staggers the imagination and seems an impossible task for Noah and his sons. The Scriptures, however, do not suggest that Noah had to build the ark without the help of hired men. After all, the size of the timbers for such a huge vessel would likely have been beyond the powers of four men to handle. After the flood, the ark came to rest upon the mountains of Ararat. The mountains of Ararat are in present-day Turkey. While Noah and his woodworking crew displayed exceptional skills in building the ark, the Hebrew Bible paints a different picture of the Israelite woodworkers during the time of Solomon. As written in Chapter 5 of 1 Kings, Solomon had to import Phoenician artisans from the coastal city of Tyre to build his temple. The Phoenicians were skilled in intricate woodworking such as making furniture and inlaying them with ivory carvings, but as the years passed, the Israelite’s woodworking skills improved. In Isaiah 44:13, the prophet describes the carpenter and his tools, suggesting that during the era of the kings, the Israelites were becoming more adept and involved in carpentry. In fact, carpenters were among those Israelites exiled to Babylon after the Babylonians captured Jerusalem in 597 B.C. (Jeremiah 24:1; 29:2). Lebanese cedar, imported from Lebanon, was one of the most popular building materials used in the Biblical world by ancient woodworkers because of its high quality, pleasant scent, and resistance to both rot and insects. Many temples, palaces, and seagoing vessels were made from this wood, including Solomon’s famed Temple. This cedar was also used in the construction of the so-called “Jesus Boat” of the first century A.D. In 1986, two brothers discovered the boat in the northwestern shore of the Sea of Galilee after a tremendous drought had lowered the water level. It was similar to the boats Jesus and his disciples would have used to cross and fish the Sea of Galilee. Almost 27 feet long and over 7 feet wide, the boat’s types of nails and hull construction placed the boat’s origin between 100 B.C. and 100 A.D. It was the first near-complete boat ever found in the Sea of Galilee. Early Chinese civilizations also promoted the art of woodworking. It’s believed that woodworking mushroomed in that country starting around 720 B.C. When that happened, the Chinese developed many sophisticated applications of woodworking, including precise measurements used for making pots, tables, and other pieces of furniture. During this time, a well-known carpenter, Lu Ban, was credited as being one of the originators of woodworking in China. It’s believed he brought the plane, chalk line, and other tools to China. Some 1500 years after his death, his teachings were compiled in the book Lu Ban Jing (“Manuscript of Lu Ban”). This book documented his work as a carpenter and contained descriptions of dimensions for building various objects – such as flower pots, tables, and altars. It also provided specific instructions concerning Feng Shui (wind and water). Feng Shui is the ancient Chinese practice of geomancy, that is, the positioning of physical objects in strategic locations in the home and in work environments to stimulate optimal wellness, health, and happiness. Ironically, the book says almost nothing of the intricate glue-less and nail-less joinery for which Chinese furniture was so famous. Woodworkers today who practice the ancient oriental woodworking techniques take pride in their mastery of the fitted joint and their skill of not using electric equipment, nails or glue to hold their pieces together. Japan is where this style of woodworking primarily originated. One reason for Japan’s success in such excellent woodworking was that they developed high-carbon steel tools early in their history. Their use of high-quality blades and the engineering of the lathe made ancient Japanese woodworkers leaders in crafting round and curved objects. Cooperage (the making of barrels and casks) and bentwood works (wood that is artificially shaped for use in making furniture) were popular in Japan for everyday household objects. Japanese woodworkers also made exquisitely-sculpted scenery. Their popularity and the techniques used in the process spread across Southeast Asia. Another highly skilled form of woodworking was blocked prints – made from inked blocks of wood. Lacquering also was developed in the orient. It is a technique dominant in Japan, China, and Korea. Recorded in the Gospels of Matthew and Mark, we find that Jesus’ adopted father Joseph was a carpenter. In the Jewish culture of that time (1st century), the father was required to teach the son his trade at age 12. Being a good Jew, Joseph would have followed this practice and began teaching Jesus at 12 his carpentry trade. Carpenters of the time of Jesus were often called upon to construct or repair plows or threshing sleds, or cut a roofing beam or shape a yoke for a new team of oxen. They also met the demands for new doors and door frames, or a storage chest, and made a variety of other repairs. Sometimes they helped with the construction of larger building projects, such as building a wood balcony or making doors or stairs for a new synagogue. And, on occasion, a master carpenter would be asked to create a holy object such as a Torah cabinet for the storage of Scripture scrolls. Hebrew carpenters used a variety of wood species depending on what the job required. They included cypress, oak, ash, sycamore, and olive. If it were a special project, they might have to import expensive cedar from Lebanon or use the stock of vines for small projects. When a carpenter needed wood, he sawed trees into boards using a large bronze saw with the aid of other workers. He cut thin boards from tree trunks. Trees in that region, however, were not large or straight. Among the carpenter’s tools mentioned in ancient sources were the saw, mallet, adze, plummet and line, chisel, rule stick, plane, and squares. They also used the bow drill, held in one hand by the handle, which they rapidly set in motion by drawing the attached bow back and forth. The bow-lathe was a crude primitive tool, yet a skilled woodworker could produce decorative spindles and bowls with it much like today’s woodturners. He turned the wood by pulling a leather strap back and forth like a bow. This motion moved the lathe and enabled the cut to be made in the turning wood. With these tools at hand, carpenters from Biblical times possessed the skill to create intricately dovetailed, mitered and dowelled joints. Combining considerable skill and patience, they often created splendid wood products. Woodworking in the Middle East goes back for many centuries, even to Biblical times, as evidenced in the descriptions of some items. For instance, the Book of Exodus chronicles the construction of wooden holy items for the Tabernacle of the ancient Hebrews. The ancient woodworkers of the Near East built great wooden boats out of timber that grew in the Anatolian plateau (the Asian part of Turkey) along the Levantine coast (the Mediterranean coastal lands of modern-day Turkey, Syria, and Lebanon). This wood was so coveted that invading armies often demanded it as a tribute. Archaeologists found furniture crafted from wood inlaid with bone, ivory or metal that dated as far back as 800 B.C. at Gordion, the alleged home of the mythical King Midas. Near East woodworkers used lathes as well as wedges, mallets, chisels, hammers, drills, plumb bobs, compasses, and other basic tools. The wooden windows of the early mosques and private houses still seen today in the Arabic culture were crafted at the height of ancient Near East woodcarving. The Muslim woodcarvers of Persia, Syria, Egypt and Spain designed and created exquisite paneling and other decorations for wall linings, ceilings, pulpits, and all kinds of fittings and furniture. Their woodwork was elaborate and minutely delicate. The Roman Empire also had its share of skilled woodworkers. Wielding adzes, lathes, files, planes, saws, and drills, including the bow drill, they constructed aqueducts and waterworks using wooden scaffolding, built impressive warships and barges and erected strong and lethal battering rams and catapults for attacking enemy cities. They also crafted furniture, including tables and chairs that stylistically represented the arms of animals or that were carved to represent mythological creatures. Archaeologists were delighted to find a furniture shop intact in Pompeii, an ancient resort city destroyed in 79 A.D. when Mt. Vesuvius erupted. They also discovered wooden furniture and decorations, and the methods of building. Roman woodworkers used a variety of woods for their wooden creations. Wood species included ilex, beech, maple, elm, olive, and ash. The most prized wood in the Roman Empire was the African wood Tthyine, which was believed to have mystical powers. It was used by both the Romans and Greeks to make furniture. Thyine, from the Cedar family, is a fragrant and beautiful wood the Romans called citrus or citron wood. It comes from a North African tree and was alluded to in Revelation 18:12 as being among the items which would no longer be purchased when Babylon fell. The medieval period, also known as the Middle Ages, occurred during the one thousand years between the fall of Rome and the Renaissance, from about 400 A.D. to the 15th century. Since wood was the most common building material in the Middle Ages, carpenters prospered. They also were considered to be among the most skilled craftsmen. Carpenters, however, had to belong to guilds – groups that were designed to protect the interests of people in certain occupations. They also were required to do apprenticeships with established carpenters. Their tools were much simpler than what we use today, but they had to know how to use them as well as know math and woodworking. This knowledge was necessary in order to create furniture, wagons, and homes for people of that era – even kings and lords. All buildings used wood in some way. Buildings were sometimes constructed almost entirely out of wood, from the framing for their walls and roofs to their siding and shingles. Even stone buildings required considerable wooden construction. For instance, while being built, wood was needed for scaffolding, ramps and frames to support arches until the mortar hardened. Later, wood was used for doors, window frames, floors, roof beams, and some interior walls. Although most of the wooden buildings of the Middle Ages have long since vanished, we still have contemporary illustrations of buildings and other wooden structures either completed or under construction. Woodworkers of the Middle Ages also were skilled in creating wooden figurines and statues, some of which still stand today. These Byzantine or Gothic art pieces showed that woodworkers exhibited extreme patience in their woodworking and their love of this skill. Tools are like windows to the past. They allow us to view the civilizations that created them. Obviously, the more wooden objects a society produces, the more tools it needs and uses. In some instances, societies advanced slowly or even regressed when it came to the development and use of woodworking tools. For instance, the Roman joiner had a larger tool chest than his medieval counterpart. Axes and adzes were among the first tools created. Woodworkers used the axe to fell trees, and the adze, whose blade was turned 90 degrees, to dress timber. The Minoan civilization of Crete used a combination axe-adze and invented the double-headed axe. The ax-adze was popular with Roman carpenters. The handsaw was used in Egypt as far back as 1500 B.C. It had a broad blade, some as long as 20 inches, curved wooden handles, and irregular metal teeth. Since the blades were copper, a soft metal, they had to be pulled, not pushed. Because the carpenter could not bear down on the cutting stroke, sawing wood must have been a slow, tedious process. The Romans improved the handsaw in two ways. They used iron for the blades, making them stiffer, and they set the teeth of the saw to project alternately right and left. This made the saw cut slightly wider than the blade and allowed a smoother movement. The Romans also invented the frame saw and the stiffened back saw, with s blade that is reinforced at the top to afford straight-through cuts. The frame saw uses a narrow blade held in a wooden frame and is kept taut by tightening a cord. The principle of the frame saw lives on in the modern hacksaw. Roman builders used the try square (also known as the carpenter’s square), the plumb line, and the chalk line, tools developed by the ancient Egyptians. Egyptian woodworkers also used wooden pegs instead of nails and made the holes with a bow drill, which they moved back and forth. Since the bow drill is ineffective for heavy drilling and wastes energy, the Romans came up with a better tool: the auger. The auger has a short wooden cross-handle attached to a steel shaft whose tip is a spoon-shaped bit. It enabled the woodworker to apply great rotational force and heavy downward pressure. Woodworkers in the Middle Ages created a breast auger for drilling deep holes in ships’ timbers. It is topped by a broad pad on which the carpenter rested his entire body weight. The Romans improved upon the Egyptian’s wooden pegs by inventing forged iron nails. They also created another dual-purpose tool: the claw hammer. Chisels are more ancient tools. Bronze Age carpenters used them with both integral handles and socketed wooden handles for house and furniture construction. The first mallets, shaped like bowling pins, were pounded across the grain and didn’t last long. Eventually, a handle was fitted to a separate head. These made a more durable hammering surface. Discovering preserved ancient wooden artifacts thrills modern archaeologists. It gives them – and us – a special glimpse into the past and provides a tangible link between us and the people of past societies. Unfortunately, countless objects made of wood did not last as long as ones made from clay or metal. Wood is naturally very durable and capable of lasting for thousands of years without significant change if kept in moderate, sheltered environments. When the wood is exposed to fungi (molds and mildews), insects, termites, light, excessive heat, and excessive moisture, however, it is doomed to suffer biological deterioration. This is what happened to many of the wooden objects created centuries ago. Moisture can be one of the most difficult conditions to control. Wood takes on moisture in high relative humidity conditions and releases it when the humidity is lower. Excessively high moisture conditions can cause wood to swell. This can result in crushed components along with finish and glue failure. Excessively low moisture conditions can damage the wood, too, resulting in splitting, gaps in joints, and lifting veneers and inlays. Because the dimensions of wood can change when exposed to moisture and heat, the skilled woodworker must be able to anticipate these variations so as to maintain the integrity of the finished piece. Failing to take moisture content into account is a recipe for disaster. One tool that ancient man never had the good fortune to possess is the moisture meter. Wagner Meters engineered the first practical and portable electromagnetic wave moisture meters in the 1990s. Since that time, other companies have started manufacturing pinless moisture meters. The Wagner moisture meters were designed to cancel out surface moisture. IntelliSense™ technology allows its wood moisture meters to measure the percent of moisture in the wood instead of on the wood, solving the major drawback of most pinless moisture meters. Wagner meters also are designed to enable woodworkers and flooring installers to “scan” many board feet of wood easily and quickly. This is handy when having to check a large volume of wood samples or for simply doing a quick check of current conditions. Because Wagner meters have no pins, they do not damage wood surfaces, as do pin meters. They also read moisture content ranging from 5% to 30%. The MMC220 meter, Wagner’s most popular model, is ideal for measuring moisture in all wood species – hardwoods, softwoods, and even exotic tropical woods. It offers moisture measurement to the tenth-of-a-percent precision. The Wagner Meters MMC205, ideal for hobbyists, is useful for wood flooring and woodworking applications that specify common softwood and hardwood species that do not require moisture measurement to the tenth-of-a-percent precision. 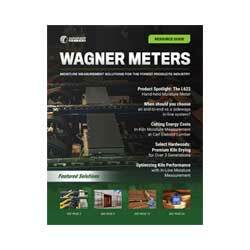 While many ancient tools lacked durability, Wagner meters are built to last. It’s why they come with an industry-leading 7-year warranty and complete customer satisfaction guarantee. Throughout the history of mankind, great forests blanketed many parts of the world. They provided civilization with a valuable and plentiful resource: wood. Wood was a material easy to work with and shape, so artisans used it in many diverse ways. They created weapons and siege devices from wood. They built houses, temples, boats, furniture, plows, and even coffins using local woods, or for special needs, imported fine, aromatic woods from distant lands. They also sculpted statues and other decorative pieces from wood. When stone structures were erected, woodworkers used wood scaffolding to aid in their construction. As civilizations advanced, they invented new tools to cut and shape wood, or improved existing ones. Most of the hand tools woodworkers’ use today have changed little since ancient times. The inability to monitor the moisture content of a piece of wood and allow it to acclimate to the surrounding environment before using it has led, regrettably, to the ruin of many finished objects. It is one reason why countless wooden objects from centuries past have vanished forever. We’d like to do our part to make sure that doesn’t happen to your project. It should be noted that there are a number of experts who hotly dispute the finding of the ark. However, Archaeologist Robert Ballard, who found the Titanic, says he has compelling evidence that suggests a monstrous ancient flood did indeed occur. While Ballard cannot say for certain the ark existed, the Biblical flood story is similar in some respects to the Babylonian epic of Gilgamesh, reports National Geographic. Also, the ancient Greeks, Romans, and Native Americans all have their own take on a legendary flood. Tony Morgan is a senior technician for Wagner Meters, where he serves on a team for product testing, development, and also customer service and training for moisture measurement products. Along with 19 years field experience for a number of electronics companies, Tony holds a B.A. in Management and his AAS in Electronics Technology. Loved this overview of the history of woodworking! Appreciated the inclusion of Biblical contributions 🙂 Thanks for this article! Thank you very much and I learned many important things on wood crafting from you beautiful writing. Wood crafting ancient history to modern days wood work. This was a really great overview of the history of woodworking. I really appreciated the look into various cultures across the Middle East, Asia and Europe. Thanks for taking the time to put this together! What a clear and concise way of educating and imparting knowledge about wood history since time immemorial. Thank you I am thrilled. Keep well Tony. A good informative summary of the skill and history of carpentry, well done Sir, thanks for your efforts.